Always on the lookout for some light relief in this line of work, I just found a link to this highly amusing video on Inside Divorce. Sung (and I assume written) by Stephen Lynch, Lullaby is a song in which a father explains to his daughter why mummy isn't there any more. Enjoy. In my view, the debate is not about marriage versus lone parents. The debate is about how you target measures specifically on those families some of whom will be lone parents - but some of whom will be couples. All well and good. However, he also said: "Of course it is the case it is better to have kids in a stable relationship. Of course marriage is a good thing". I have no problem with the first part of this (provided one does not then leap to the conclusion that lone parent equals delinquent child), but I'm not entirely happy with the blind assumption that marriage is 'a good thing'. It is perfectly possible to do an excellent job of bringing up children without having a marriage certificate. Come to think of it, I'm not sure I agree with Tony Blair after all. That's a relief. The preoccupation of the press and the “golden circle” of solicitors who deal with these big-money cases does not reflect the problems which face the court in most cases. While the laying down of principles in these cases… is intellectually interesting, it is scarcely related to the real needs of 95% or more of the litigants who come before the family courts. Perhaps more media coverage should be given to those things that affect the vast majority of people involved in the family justice system? The Office for National Statistics reported yesterday that the number of marriages in England and Wales decreased by 10% from the previous year, to the lowest number since 1896. Sounds pretty dramatic, although the ONS does point out that a change in the law from 1 February 2005 designed to discourage 'sham marriages' may have been one of many factors that contributed to the drop. As The Times points out today, the opposition parties are gleefully going to use the data as evidence that Labour policies have hastened the demise of the institution of marriage. However, the article goes on to quote Jenny North, head of public policy at Relate, who suggests a more prosaic reason - the increasing cost of weddings. No doubt there are a number of reasons for the decline, but I would like to suggest another, from my experience as a divorce lawyer: the increasing perception amongst men that they will be treated unfairly if the marriage breaks down, fuelled by lurid media reports of high-profile divorces where this appears to be the case, whether or not it is, indeed, the case. Still on the subject of blawgs, I've finally gotten around to adding DivorceSolicitor to my blogroll. 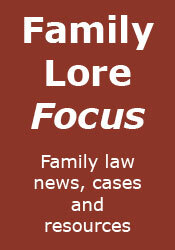 DivorceSolicitor remains (to my knowledge) the only other UK blawg relating to family law, and was recently kind enough to include a link to Family Lore. Time to recommend a couple of new (or fairly new) blawgs, both coming from the other side of the profession, and both already recommended elsewhere. Firstly, the excellent and highly interesting (not to mention entertaining) BabyBarista, by a pupil barrister who "was educated at Oxford University and is a member of the Inner Temple and is in a mixed common law and criminal set of Chambers in London". BabyBarista describes the blog as "a fictional account of a pupil barrister undergoing the trials of pupillage at the English Bar", and insists that it is not based on fact, but I have my doubts. He also has the excellent taste to use the same blog template that I previously used here. My second recommendation is Legal Beagle, which only began last month, but which hopefully will go from strength to strength. It is described as "a barrister's cynical take on that hotbed of scandal and controversy, the criminal justice system", and is by a barrister who says she has "been trawling around the criminal courts for a few years now so thought [she] was just about qualified to wade into the debate and attempt to give a true picture of life at the Bar" (well, life at the criminal bar anyway). Forced marriage is not something I've come across in my twenty-odd year career, but if I ever do I hope it's after the Forced Marriage (Civil Protection) Bill has passed into law. The primary remedy offered by the Bill is an injunction – that is, an order by the court that acts must not take place which will lead to a forced marriage. In making such orders, the court must have regard to all the circumstances including the health, safety and well-being of the victim. As a secondary remedy, the Bill allows civil proceedings to be brought to obtain compensation where an injunction cannot provide an effective remedy. By using civil remedies rather than criminal law, the Bill empowers young women and men to win respect for their human rights. The Bill had it's second reading on the 26th January, and will be considered further in March 2007 by Grand Committee in the House of Lords, where amendments will be discussed. Possible changes to the Bill are set out in this consultation paper, the most interesting of which is aimed at allowing either party to a forced marriage to seek a nullity petition even after three years from the marriage, thereby removing the 'stigma' of having to seek a divorce. A man who had a row with his partner took an axe to household fixtures to express his frustration. I hope he felt better afterwards, because we awarded compensation of over £6,000 to the housing association that owns the house. That works out at around £600 per minute of temper-time. Of course, such behaviour does not only have financial consequences. Firstly, Judge Paul Collins tells Radio 4's Law in Action programme that the county courts system is 'in chaos', due to low pay and staff shortages. The report doesn't mention that the county courts deal not only with civil cases but also with most family matters, including divorce. I have certainly experienced mistakes being made, and huge delays in dealing with paperwork. As the judge points out, the problem is being exacerbated by fewer people getting legal aid, and therefore representing themselves. It is interesting that the report states that last year the income the courts received from fees exceeded their costs, and the surplus was spent on other services. This makes the fees a type of taxation - what is the rationale for court users paying a tax? Surely (and obviously) the full income from fees should be put into the courts system. The other story is a video interview with Louise Campbell, the mother of Molly Campbell/Misbah Rana, who recently gave up her application for custody of her daughter. The most interesting thing about this to me is that she expresses her regret at bringing her children up as Muslims, wishing she had let them decide the matter when they grow up. I agree entirely - it is surely wrong to teach a child that one faith is better than another, and it is obviously a nonsense to describe a child as a 'Muslim child' or a 'Christian child', just as it would be a nonsense to describe the child of a communist as a 'Marxist child'. I've said before that I don't usually comment upon celebrity divorce cases (although it has been impossible to ignore the McCartney divorce), but I must make an exception to express my dismay at this report of Chris Tarrant's divorce. Extremely bad taste, and hardly an original joke. Well, this is going to go down like a lead balloon. The government has revealed in a written Parliamentary answer that since 2001 staff at the 'failed' Child Support Agency received bonuses totalling £25,661,000. Somehow, I don't think that this news will be greeted with any satisfaction by those unfortunates who have had the pleasure of using the agency. That this House, while accepting that the legal aid system is in need of reform, is concerned that the Government's planned implementation of Lord Carter's proposals could force several hundred law firms out of business leaving vulnerable clients without access to effective representation; is concerned that the proposals identified in the Carter Review could further endanger the supplier base; notes that the changes to the proposals announced by the Government on 28th November 2006, while welcome, do not go far enough; welcomes the Law Society's `What Price Justice' campaign to boost awareness of the potential risk to the most vulnerable people in society and notes that it is supported by MIND, the NSPCC, Shelter, the Refugee Council, the Child Poverty Action Group and others; and calls upon the Government to guarantee a legal aid system ensuring quality representation and fair access to justice for all. If the reforms are brought into action. It is widely predicted that many legal aid law firms will stop doing legal aid work. This will leave the most vulnerable in society at very real risk, including women and children subject to abuse. In some areas there will be no access for justice. In many areas it will be greatly reduced. It is important that this does not happen. Today, I helped a woman and her four children escape a violent husband. Don't make me and many others give up this valuable work! Despite having no vested interest (I no longer do legal aid work), I have signed the petition, and I recommend to all readers of this blog that they do likewise. This is not about "fat cat" lawyers trying to protect their interests, it is about protecting the legal rights of, as Cathie says, the most vulnerable in society. I've been wondering why recently this blog has often been slow to load, but hopefully I've now solved the problem - too many posts on the page. I suppose I should have thought of this before, but I rarely look down the page of my own blog. Apologies for any inconvenience caused. Tim Kevan's determined attempt to get all lawyers to take up surfing (the mind boggles) has changed it's name, to The Barrister Blog. Geeklawyer has firmed up the target date for the first UK Legal Blogging Conference, to the 18th or 25th May. Block those dates out in your diary! ... and Charon QC has now got wine merchants Corney & Barrow to sponsor his blawg. Highly appropriate! I can't imagine that there'll be a rush to take advantage of this, but it will now be possible for in-laws to marry, thanks to the Marriage Act 1949 (Remedial) Order, which was recently approved by the House of Lords. I'm sure this is serious for those involved, but I can't help remembering my favourite Les Dawson mother-in-law joke: "I can always tell when the mother-in-law's coming to stay; the mice throw themselves on the traps". Women's Aid has today launched 'act', "a national domestic violence awareness campaign to ask everyone to ‘act until women and children are safe’– that is - admit domestic abuse is a problem, call it by its name and talk to someone about it". The campaign uses head and shoulder portraits of famous female faces, made up to show the physical effects of domestic violence. Whilst I wish the campaign every success, and whilst I understand that Women's Aid works specifically to end violence against women and children, it would have been nice if it had mentioned that domestic violence is also suffered by many men.